Branding involves positioning and positioning involves focusing on not just what you do best but also on the market segment you serve best. Instead of trying to please all people in all ways, great brands position themselves to please some people — a defined market segment or market niche — in an extraordinary way because of the unique and meaningful attributes and experiences the brands offer. It’s a good idea to conduct research about where your customers are, who they are, what they value, and how they prefer to buy products like the ones you’re offering to define your target audience. What motivates your customers’ purchase decisions? Put differently, what needs or desires are customers trying to address when they purchase your product? Realize that the answer isn’t always obvious. A couple may say that they like the design and quality of a particular new home, for example, when really they’re motivated by the prestigious feel of the house or neighborhood. To get to the root of your customers’ purchase motivations, find out how your offering makes them feel. By uncovering the emotions your product evokes, you learn the basis of their motivation and which attributes to highlight in your branding strategy. How do your customers approach your business? Do they buy in-person, or by phone, mail, or online? Do they decide to buy on their own or based on the recommendation or approval of someone else? Does your brand need to make a promise to the product consumer or to the purchase authority or referring agent? Or both? By knowing how customers reach your business and the factors that influence their decision, you can create more effective messages, communications, and experiences. How do customers purchase your products? By studying buying patterns, you discover brand attributes that matter most to customers. Do most customers buy on impulse or after consideration? The answer may indicate a need for trust and reliability assurances. Do they pay cash, charge, or buy on payment plans? Payment plans may indicate a greater sensitivity to price. Do they sign contracts, subscribe, or opt for multipurchase or bulk deals? Long-term commitments indicate high trust. If you offer an add-on warranty or service program, do most customers take the offering or decline it? Acceptance may indicate concern over ease of use or reliability. Are they interested primarily in price, or are their decisions made based on quality, prestige, convenience, or other values? What sets your ideal customers apart? Do your most ideal customers tend to buy the same kinds of products or request the same kinds of options, and are those tendencies different from those of other customers? Do they buy from your business simply to obtain your product or service, or do they think that your offering fulfills additional needs or interests — such as the ability to socialize, to feel the prestige of joining your exclusive or trendy clientele, to enrich themselves educationally through product samples or seminars, or to enjoy the level of your expertise or the safety of your trustworthiness? What attributes of your business do you think your most ideal customers value most highly: product quality, available features, convenience (your location or your purchasing options), reliability, staff expertise, customer support and service, price (high or low — some people are attracted to bargains and others to the highest level of premium offering), or other aspects of doing business with you? How do your most ideal customers buy? For example, do they buy on impulse, in bulk, on sale, when shopping with others, when shopping online, on the recommendation of others, and so on? Do your most ideal customers share any of the same demographic or lifestyle characteristics, such as gender, age, income, ethnicity, geographic location, beliefs, or values? Studying the buying patterns and motivations of ideal customers helps determine which attributes and approaches to feature in your marketing. Take all that you know about your customers and answer this final question: Why do they choose to buy from you? Commit your thoughts to words using this template. Complete the exercise twice: once for your average customer and once for your most ideal customer. Use the information in the average customer form to determine how your brand must appeal to your current clientele. 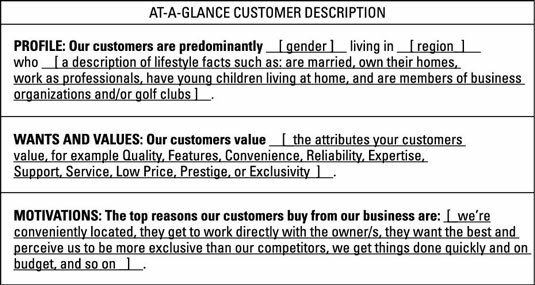 Use the information in the ideal customer form to determine which brand attributes to emphasize in order to shift your clientele to include more model customers.